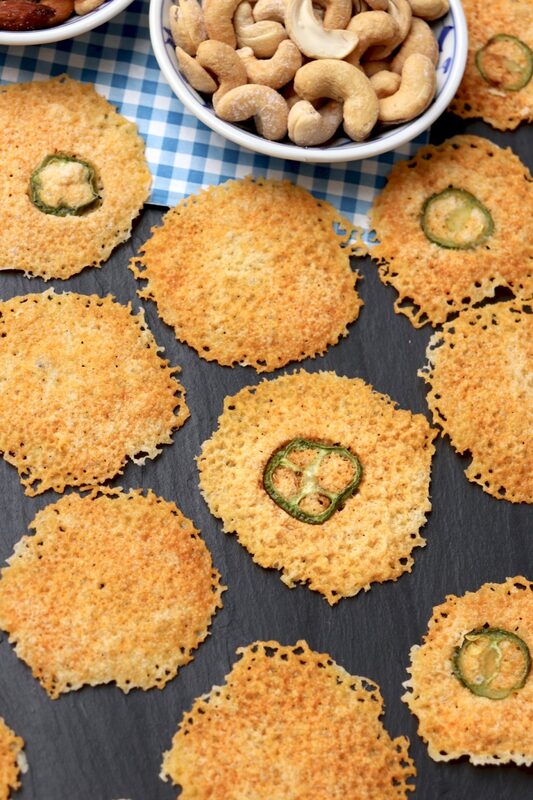 Low-carb cheese crisps require only one ingredient (jalapeño slices are optional) and cook in 2 short minutes – and believe it or not the microwave produces better results than the oven. Perfect with a glass of wine or as a flavorful option to a crouton. 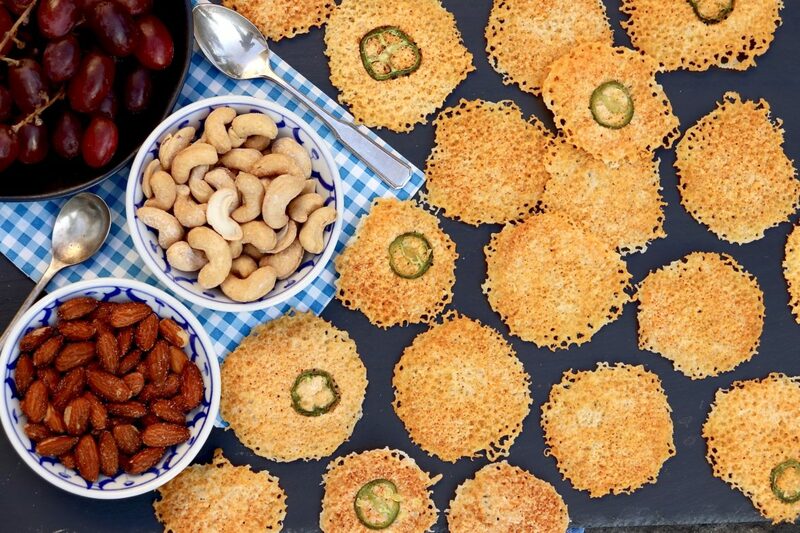 If I said you could make a light and flavorful cheese crisp with a variety of cheeses that you may already have in your refrigerator, you may not be particularly surprised. But what if I mentioned that I’ve had greater success when skipping the traditional oven preparation in favor of the microwave? 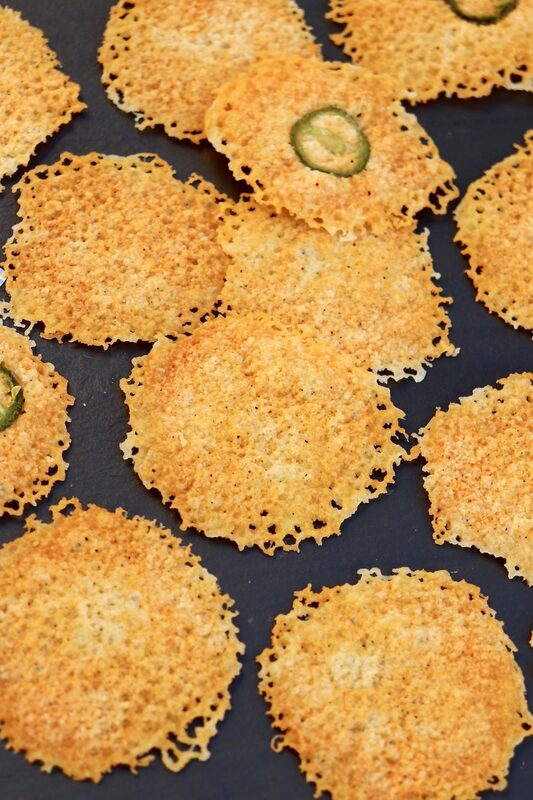 My mother-in-law, Judy, deserves credit for this easy method, which quickly transforms little piles of shredded cheese into crisp wafers. The low-carb rounds make a delightful pre-dinner nibble and a flavorful alternative to a crouton. 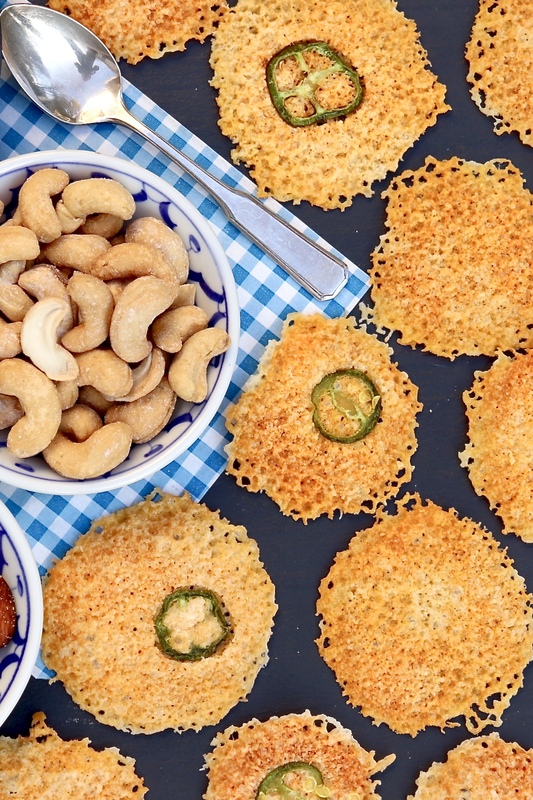 Interestingly enough, cheese crisps that are baked in the oven are more likely to burn or cook unevenly. And believe it or not, cheese really will become crisp in the microwave! Judy taught me the technique using pre-shredded cheddar cheese, which she strictly adheres to for its appealing flavor and consistent results. Never one to pass up a good kitchen experiment, however, I eventually put a variety of cheeses to the test. Several years ago, I was working on a project for Sargento Cheese and happened to be in need of a last-minute hors d’oeurve. A quick scan of the fridge revealed a sheer excess of cheese. I had cheese sticks, multiple varieties of shredded cheese and cheese slices, both regular and thin. Wouldn’t it be fun to see how they all fared when zapped in the microwave? I was pretty sure that microwaving a soft cheese stick would result in a goopy mess, and I had my doubts about the thin slices. Though there was a minor variation in timing that needed to be ironed out, I was surprised to find that every variety ultimately produced a worthy crisp. Wondering if the “extra” ingredients present in some cheeses would alter the outcome, I made a batch using a more processed brand. That outcome was not as good. Armed with this discovery, I later made cheese crisps with a variety of block cheeses, which I shredded myself. Figuring cheese in this form was the least processed of the bunch, I was confident of a successful result. Interestingly enough, the results were inconsistent. Some worked perfectly and others flopped. When problems arose, it seemed to be the result of not enough moisture (which yielded very dry crisps) or too much separation of the milk fat (which simply didn’t crisp well). The bottom line is that I can almost guarantee a favorable outcome when using any variety of shredded cheddar cheese as well as slices, sticks and other shredded products made by Sargento. (Note this is not an advertisement for the company.) 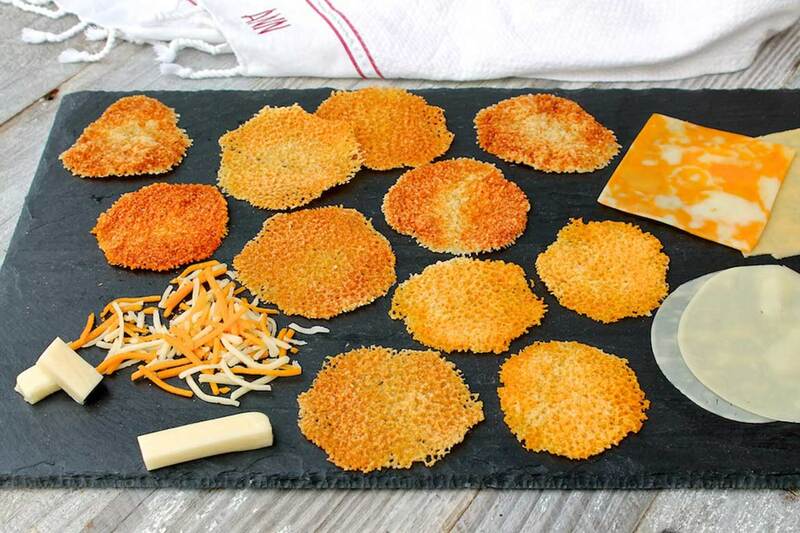 If you’d like to prepare the crisps with another variety of cheese, simply do a test batch. The time investment will be minimal – as will the waste if the results are less than ideal. I recommend cutting a piece of parchment the size of the microwave’s glass turntable ⬇︎ and cooking right on it. After each batch, remove the crisps to a paper towel, wipe off the parchment with another paper towel (as some of the fat cooks out of the cheese during the cooking process) and reuse the same piece of parchment. Don’t be alarmed if you open the microwave door and see what at first glance looks like a misshapen spread of melted cheese. Once the grease is blotted away and the cheese cools slightly, the rounds will crisp up and resemble those in the photo. Recently, I thought to add a very thin slice of jalapeño pepper to the top of the cheese pile before cooking. 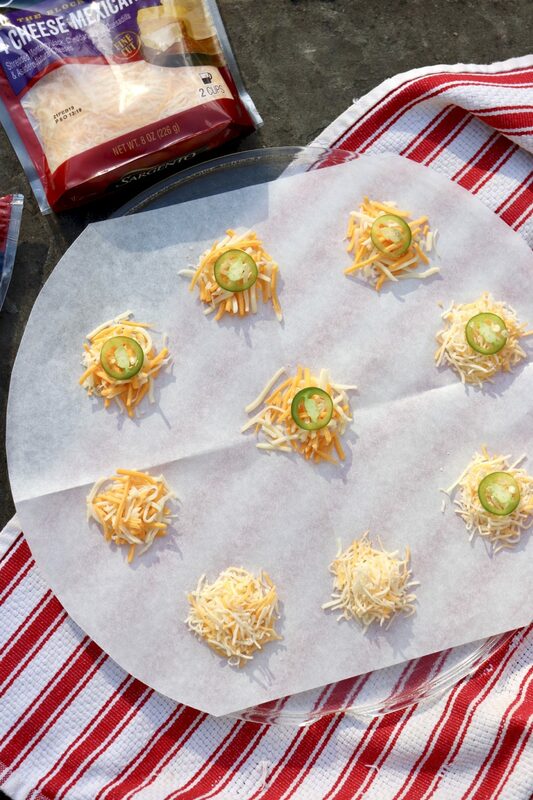 The flavor pairs beautifully with cheddar and Mexican blend cheeses, isn’t overly spicy and looks rather festive. As mentioned above, results do vary from one brand of cheese to the next. I’ve had consistently successful results with Sargento’s cheeses, so I do recommend them in this case. I’ve used their Gouda, Mozzarella, Provolone, Double Cheddar, Mexican blend and more, in slices, stick and shreds. When branching out, simply run a test batch to ensure success. Cut a piece of parchment paper the size of your microwave turntable and place it on the turntable. For the shredded cheese: Place slightly rounded tablespoonfuls on the parchment with a couple inches of space between them. For the cheese sticks: Cut in quarters and place 2 quarters side by side on the parchment. (Each cheese stick will yield 2 crisps.) Make as many as desired, leaving a couple of inches between each one. For the Ultra Thin slices: Fold each slice in half, then in half again, spacing as directed on the parchment-lined turntable. Each Ultra Thin slice will yield 1 crisp. For the regular slices: Fold each slice in half and then break into two even pieces. Break each piece in half again. Stack 2 quarters on top of each other, forming 2 piles per slice, spacing as directed once again. Allow the crisps to cool enough to touch. Remove to a paper towel. Wipe the parchment with another paper towel and repeat as often as desired. Once cooled, eat and enjoy, and store any leftovers in an airtight container at room temperature. *If using the optional jalapeño, place 1 thin slice in the center of the uncooked cheese and cook as directed. 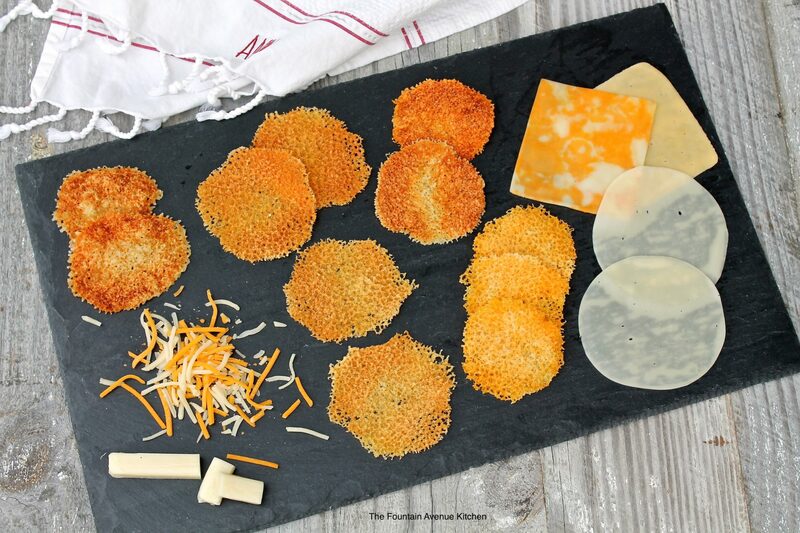 These low-carb crisps of cheese are light and crispy with a hint of saltiness － and they make a fun experiment using a variety of cheese you may already have on hand. very well written and explanatory. I love the Sargento motto which should be every business’s motto btw. and I enjoy their cheeses. since you’ve written so favorably about them, I plan to buy their product more often. thank you for this and yes, I will be trying it. cheese = nominess. Thank you for your comments, Susan. I always feel better about buying the products I like when I feel good about the company behind them. Sargento is truly a big company with a small family feel. wow! I cannot believe how easy this looks! and as Susan has posted above, I too will be buying more of their products. I am impressed and I really thank you for sharing this information about them Ann. 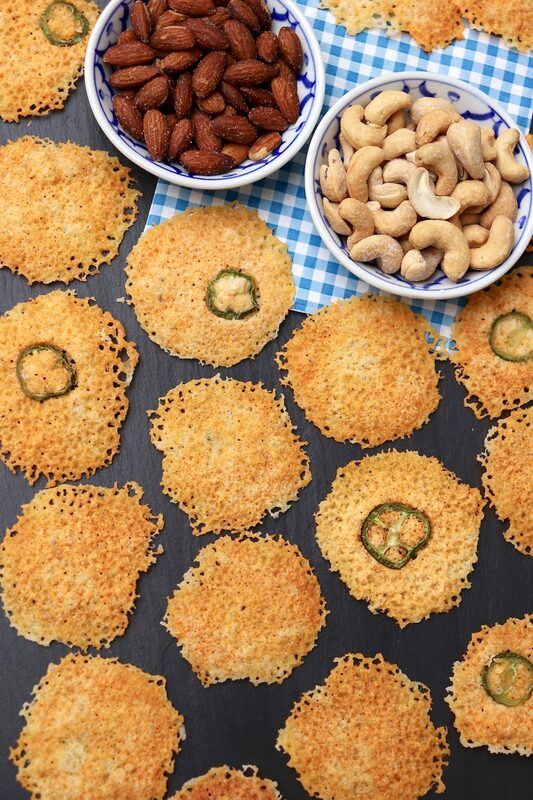 As for the cheese crisps… OHHH MYYYY. there is a lot of food I can learn to live without but cheese is NOT one of them. Can’t wait to try these recipes. I know you will enjoy them, Mary Lou! And I am with you, cheese makes everything taste better…enjoy! What would the directions be for cooking in an oven? I don’t use a microwave. Thanks! To make these in your oven , I would recommend five to seven minutes at 350 degrees F. Exact time will depend on the amount of cheese and your oven, as ovens may vary. If you watch closely during the last couple of minutes, you will get a feel for exactly how long it takes. I hope you enjoy! Yummy yummy! Just tried with the extra sharp cheddar slices Ann.. WOW I have found my new favorite way to love cheese. Oh my gosh what a find!! I tried this with finely shredded swiss and with medium shred white cheddar, both straight out of the freezer. Since I was doing a test batch, I made 4 crisps of each cheese, one cheese at a time. The swiss took about 30 seconds and the cheddar about 50 seconds, so they need watching, depending on the power of your microwave. They were both delicious, but if I make a large amount for a party, I think I will cycle different parchment paper in and out, as it helps to give the crisps a few seconds to cool before popping them off the parchment paper. So glad you found these, Carol, and great suggestions. There can be a big difference from one microwave to another. On the other side of the spectrum, they take over three minutes in my mother-in-law’s microwave! I have been doing this for years on a saucer, but parchment paper works for me. I LOVE the taste of cheese this way! So good and so easy…and the parchment works beautifully. Thanks for your comment, Renee! Pingback: The Fountain Avenue Kitchen – Pimento Cheese Spread…and a 50th anniversary celebration! We are having a problem with cheese sticking to parchment paper. Is there a certain type of paper we should use. We get the cheese to get crisp in Micro but cannot get it iff the Parchmrnt paper. Please help us cause we really love cheese. I have never had that problem, although I think you can fix it. My best suggestion would be to lightly oil the parchment…and then try another brand when it’s time to replace. If you still have trouble, let me know and I will keep thinking! We have tried the oiling with no luck. We are going to try a different paper but we didn’t know if there was a brand that had the best results. Thank you for responding and do let us know if you have anymore suggestion. We do low carbohydrate eating and this really fits the plan. I really want to add this to our list of available foods. I thought mine were stuck because they looked stuck. I let them cool a few seconds then peeled right off. I’m using Walmart parchment paper and I’ve used Reynolds and I’ve used Dollar General brand. They all worked well. I’m delighted they worked so well for you, Liz. Thanks for your comment! Success! We bought some Reynolds parchment paper and that did the trick. We were using a paper by Cooking Concepts which probably came from one of the Dollar type stores. I have made around 80 or so and not one stuck to the paper. We love them. Thank you so much for helping. Look forward to trying all you examples. Great news! I actually just looked and I have Reynold’s brand currently, too. i’ve used other brands as well, so the one you mention must have something a little different in it! Enjoy the cheese crisps! Hi Ann! I got back from Costco tonight with a large bag of shredded parmesan cheese and the goal of making some cheese crisps. Of course, the first place I looked was Fountain Avenue Kitchen and voila! — there was your fantastically easy recipe. Thank you! I really wondered if they got get crisp in the microwave so I did some in the microwave and some in the regular oven and the microwave batch is noticeably better (crisper, faster, easier). So thank you AGAIN for sharing your cooking talents with us. Love your beautifully laid out website and how easy it is to find recipes! I know! Who would have thought the microwave would work better? Thank you for your thoughtful comment, Rila, and hope all is well with your crew! I just made these and they turned out just a beautiful as this picture. Having them with our soup tonight! OMG!! I tried doing these in the oven the other day. What a mess. I did provolone slices in the microwave and now I am addicted. Thanks. I love that the cheese crisps are a good sub for the Cheez Its (my younger son’s favorite, too!). As for the Rocky Road, how about I get a spoon and we share it? Seriously though, as a major ice cream fan myself, I’ve had the most success filling that craving with either of the chocolate smoothies/shakes I have on this site or with one of the healthy ice cream options. I’d be happy to provide links for the ones I mention, or you look around the site a bit. Here is one that could work with a few Rocky Road specific add-ins: https://fountainavenuekitchen.com/chocolate-coconut-milk-ice-cream/. My husband and I have been keto for about 7 months. We’ve lost 111 pounds between the two of us. We’ve been buying ridiculously expensive Wisps cheese crisps in an effort to find a great keto friendly snack. I found this recipe this morning and promptly tried it on the variety of different cheeses in my fridge. I grated Parmesan, I used pre grated Parmesan, I used pre grated Italian blend, I used a block of extra sharp cheddar that I cut a thick slice off of, I used pre sliced Gouda and I used two pepperjack sticks. Every single one was over the top good! I’m gonna experiment with sprinkling some spicy BBQ rub on a few, some Italian seasoning on few, fresh cracked pepper on a few. I’m sure they’ll be excellent. Ideas on other herbs or spices you might add? First of all, congratulations to you and your husband on the 111 pound weight loss, Liz. I’m sure that has taken a lot of hard work and self discipline. Secondly, I’m thrilled that you found these as an economical option to your store-bought snacks and that you’ve tried and enjoyed them so many ways. (They really are fun to make!) I’m planning on trying my next batch with a thin slice of jalapeño pepper in the center, so you could experiment with that, too. If you do try–or if you come up with any other variations you enjoy–please let me know! After I made the crips my family went crazy for them, and I have shared the technique with lots of others. So thanks for the information.